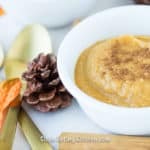 If you crave the flavor or pumpkin pie, but don’t want to bother with a crust, you’ll love this easy Instant Pot Pumpkin Custard. This recipe is paleo, dairy-free, and so delicious. I made an oven version of this recipe, but then realized it would be so much easier to make it in the Instant Pot! 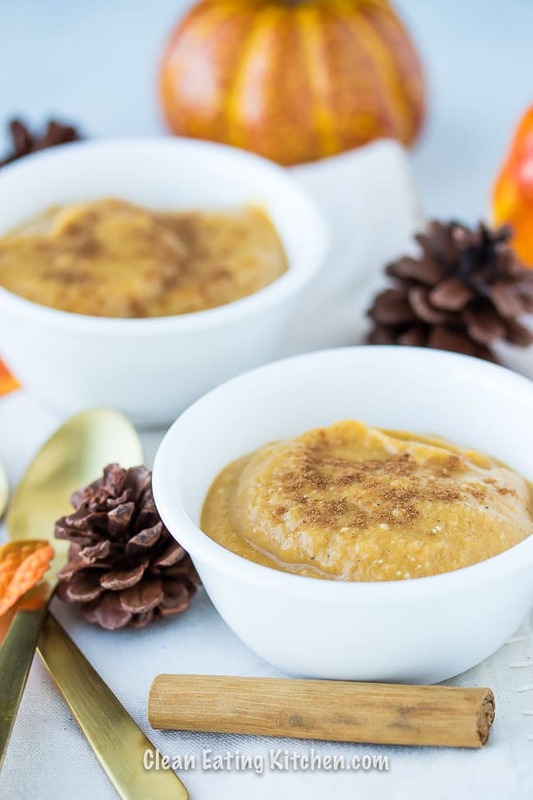 Since pumpkin pie and pumpkin desserts are so often made on Thanksgiving when oven space comes at a premium, prep this dessert ahead of time and then just pop it in the Instant Pot while you’re other Thanksgiving recipes are cooking in the oven. In less than 30 minutes, you’ll have a healthy, paleo-friendly, dairy-free pumpkin dessert ready to serve. Aren’t Instant Pot desserts just like magic? I think so! See all my Instant Pot recipes. I do recommend a 6-inch cake pan for this recipe, it fits perfectly into either a 6-quart of 8-quart Instant Pot pressure cooker. Lightly spray a 6-inch cake pan with cooking oil. Place the trivet into your 6-quart Instant Pot, along with two cups of water. 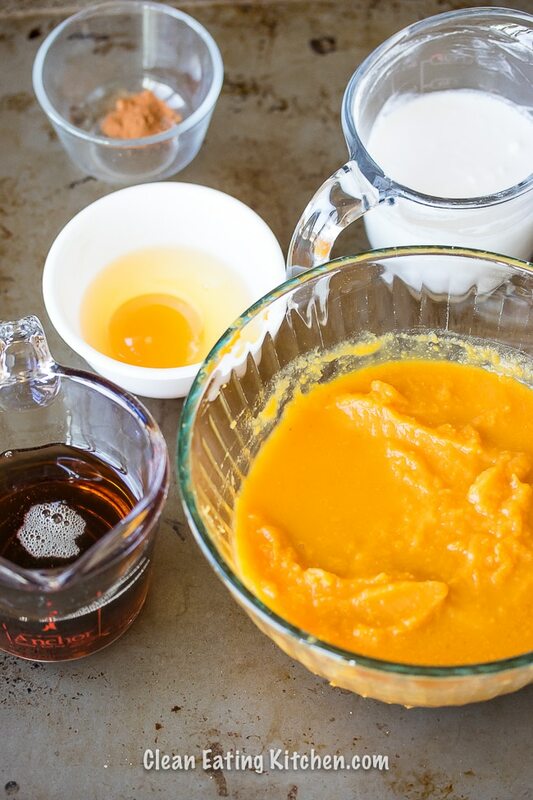 Then, in a medium mixing bowl, combine the pumpkin puree, egg, maple syrup, coconut milk, and pumpkin pie spice. Stir to combine. Pour the mixture into your cake pan and gently place it in the Instant Pot. Lock on the lid and push the button to pressure cook. Set the time to 20 minutes. Once the cooking time is complete, let the pressure come down naturally or use the quick-release. Carefully remove the cake pan from the Instant Pot. Use a serving spoon to divide the pudding between six dessert bowls. Isn’t the color of the batter just gorgeous? I made a handle for the cake pan using strips of aluminum foil, but it’s not absolutely necessary. It just makes it easier to get the cake pan in and out of the Instant Pot. I was so pleased with how this dessert came out. It will thicken a bit when chilled, but I loved it equally served warm and cold. So, it’s personal preference how you want to serve yours. 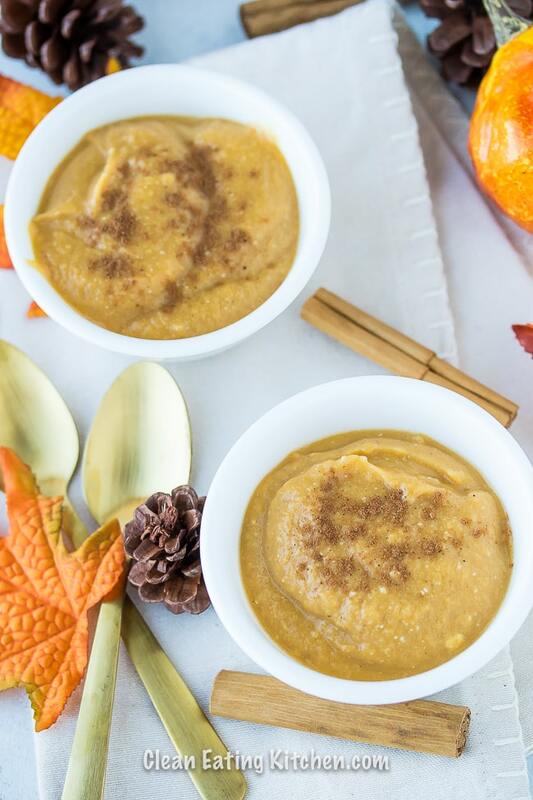 If you like this dessert recipe, you might like these other holiday Instant Pot healthy recipes. You can also download my free Instant Pot Thanksgiving Holiday e-book. All I ask is that you join my free newsletter list. Subscribe now; unsubscribe anytime. 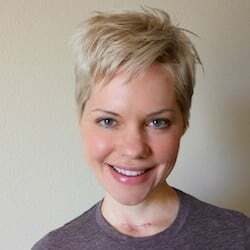 The free e-book is my gift to you! 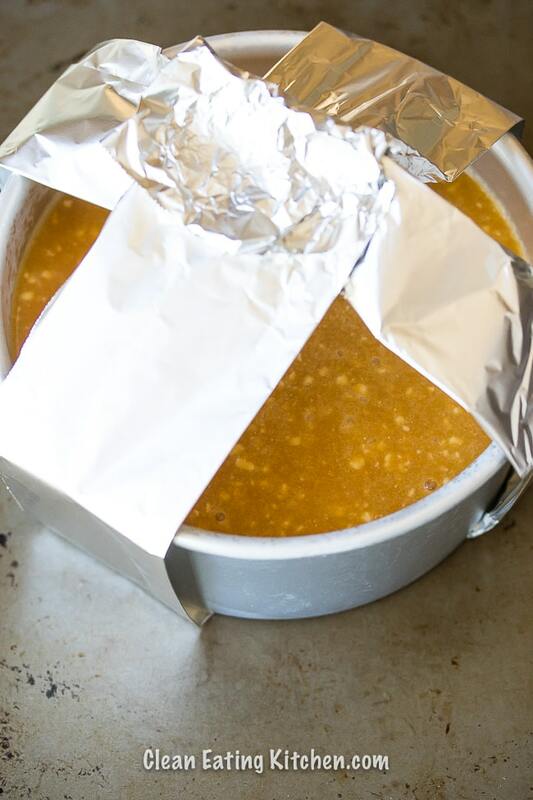 Lightly spray a 6-inch cake pan with cooking oil. Place the trivet into your 6-quart Instant Pot, along with two cups of water. 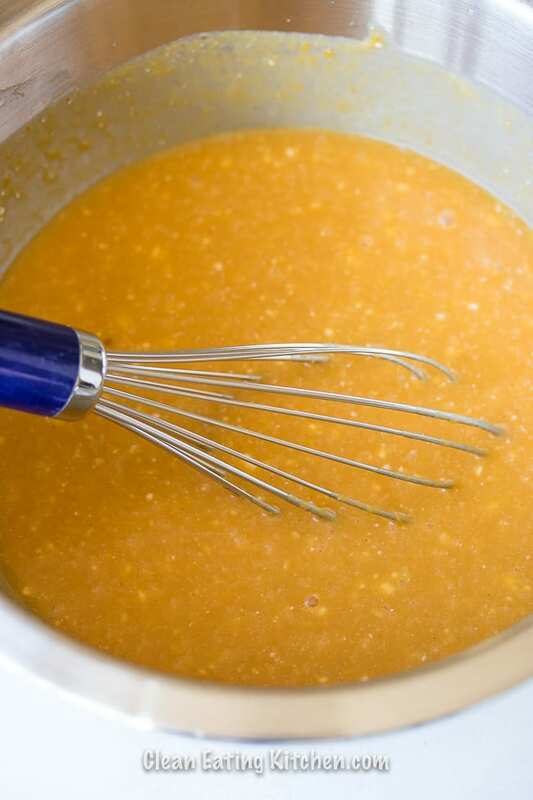 Pour the mixture into your cake pan and gently place it in the Instant Pot. Lock on the lid and push the button to pressure cook. Set the time to 20 minutes. Once the cooking time is complete, let the pressure come down naturally or use the quick-release. Carefully remove the cake pan from the Instant Pot. Use a serving spoon to divide the pudding between six dessert bowls. Serve hot or at room temperature. 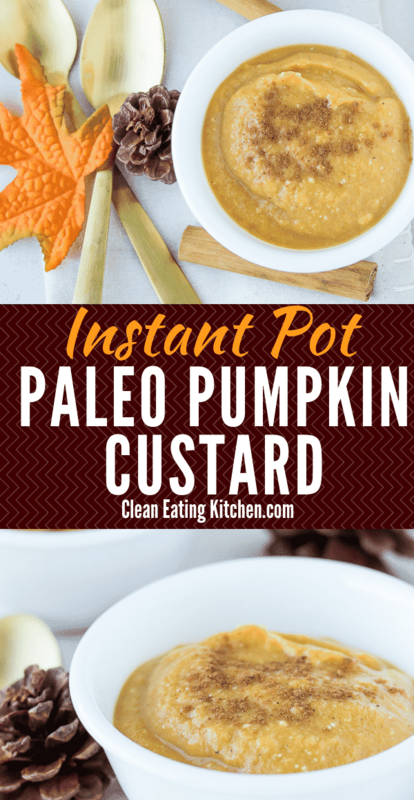 Be sure to Pin this Instant Pot Pumpkin Custard to save it for later! I’ve made this three times already. It tastes just like pumpkin pie!